The company that developed HELIOtube, an inflatable solar heat collector, received funding under Horizon 2020. The European Commission plans to give innovation a bigger boost in Horizon Europe. HELIOVIS AG. On 7 June, the European Commission will lay out detailed plans for one of the biggest single research programs on the planet. Called Horizon Europe, the program could be worth €97.6 billion between 2021 and 2027, up from about €77 billion for the current 7-year program, Horizon 2020. Its influence, however, will go beyond size. Europe’s research programs provide stable funding for 7 years, some of it up for grabs for researchers around the world. And although they represent less than 10% of the total research money available in the European Union, the continuous growth of the EU science budget in the past decades, at the expense of agriculture and regional development, is a clear signal that it sees research and innovation as the future drivers of its economy. Next week’s proposals are unlikely to contain major surprises, because the commission has unveiled its main ideas over the past months, in particular its overall 7-year budget plan, issued on 2 May. Although Horizon Europe will keep Horizon 2020’s main features, the commission has laid the groundwork for several novelties, including a new agency to tackle the continent’s perennial innovation problem and a big, separate push on collaborative defense research. But contentious negotiations lie ahead. The United Kingdom is negotiating the terms of its impending exit from the European Union, and some member states want to tighten budgets. Meanwhile, research advocates want more generous spending, noting the low application success rates in Horizon 2020—a frustrating 11.9% so far. Like previous programs, Horizon Europe will have three main “pillars”; next week’s plan will detail how much money could go to each. The first component, called Open Science, will provide funding for projects “driven by researchers themselves,” as the commission puts it, through the well-liked basic research grants of the European Research Council (ERC) in Brussels and the Marie Skłodowska-Curie fellowships for doctoral programs, postdocs, and staff exchanges. This part of the program is largely unchanged from Horizon 2020. The second pillar, Global Challenges, will set so-called missions addressing issues “that worry us daily such as the fight against cancer, clean mobility, and plastic-free oceans,” says a commission fact sheet. The “missions” are meant to be flexible, as priorities change, and they appear to have a sharper focus than the “societal challenges” named in a comparable pillar of Horizon 2020, including energy and food security. The commission says EIC will differ from the European Institute of Innovation and Technology (EIT) in Budapest, set up in 2008. EIT—the pet project of former commission President José Manuel Barroso—brings together businesses, research centers, and universities in six pan-European “Innovation Communities.” Some observers say EIC’s creation signals that EIT didn’t quite deliver and is being marginalized. The European Union’s average annual research spending would continue to grow under the commission’s proposal for Horizon Europe. In addition to Horizon Europe, the commission has proposed another bold move for research: setting aside €4.1 billion over 7 years as a separate budget line for defense research, up from just €90 million under an ongoing 3-year pilot program. Member states have long been lukewarm about cooperation in this secretive area, where national interests prevail. But in times of growing “geopolitical instability,” as the commission puts it, some member states seem more willing to pool resources. Yet some 700 scientists have signed a petition against any EU funding of military research; others worry the plan could come at the expense of nonmilitary science. “We will oppose anything that could take funding away from Horizon Europe’s civilian research,” says Maud Evrard, head of policy at Science Europe in Brussels, a group of national science funding agencies and research organizations. The commission’s €97.6 billion opening bid represents a 27% increase from the previous 7-year period—or even a 46% rise if compared to Horizon 2020 without the share of the United Kingdom, which is leaving the European Union in March 2019. But with some member states keen to tighten the European Union’s purse strings, Horizon Europe’s budget is likely to go down in coming negotiations with the European Parliament and EU member states. As a result, both Evrard and Deketelaere say they are disappointed that the commission didn’t aim higher. Negotiations for such programs can easily stretch to at least 18 months, but the commission wants to make as much progress as possible before elections to renew the European Parliament—which usually is very supportive of research—in May 2019. That will give the United Kingdom a chance to help shape the 7-year plan before it loses its seats in Parliament and the European Council. “We need to make the most of these channels whilst we can,” Jessica Cole, head of policy at the Russell Group, a London-based group of 24 leading U.K. universities, wrote in a blog post on 4 May. The United Kingdom has made clear that it wants to keep taking part in EU research programs after it leaves the bloc. This will require buying its way in through a bilateral association agreement, as other, smaller, non-EU countries such as Norway and Israel do. Other non-EU countries will be following the negotiations closely. Under Moedas’s mantra of “Open Science, Open Innovation, Open to the World,” the commission is likely to lift restrictions and make it easier for countries outside Europe and its immediate neighborhood to buy a stake in the research flagship—a sign that Europe’s horizons are widening further. The Event Horizon Telescope (EHT) is an international collaboration aiming to capture the first image of a black hole by creating a virtual Earth-sized radio telescope. We recently launched a new website that contains background material, the latest news from our team, and educational resources. At present, the EHT team is processing observations from a week-long observing campaign in April 2017 that linked together eight telescopes in Hawaii, Arizona, Spain, Mexico, Chile, and the South Pole via the technique of very-long-baseline interferometry (VLBI). This global array targeted two supermassive black holes, one at the center of the Milky Way and the other in M87, a giant elliptical galaxy about 50 million light-years away in Virgo. For each of these, the EHT has the magnifying power and sensitivity to form images of the millimeter-wavelength light emitted by hot gas near the event horizon. Einstein’s general theory of relativity predicts that the EHT should see a silhouette formed by the intense gravity of the black hole warping the light from infalling hot gas. The dynamics of matter may also be detected as hot blobs of material orbit the black hole and shear into turbulent flows. 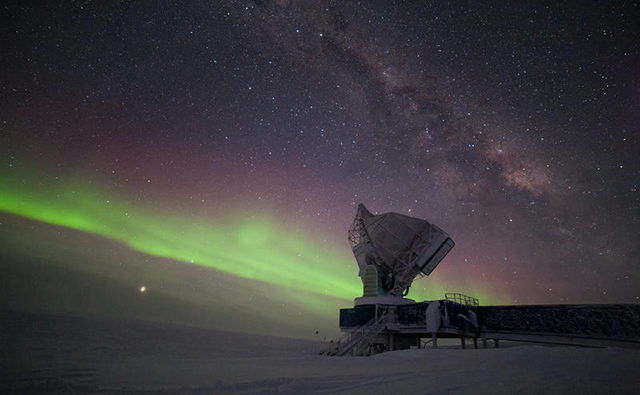 Most data recorded at all the sites have been shipped to two central processing facilities, one at MIT Haystack Observatory and another at the Max Planck Institute for Radio Astronomy, where the signals are combined in VLBI correlators. We are still waiting for the hard disks containing data from the South Pole, where they have been stored during the long polar winter when there are no flights to/from the Amundsen-Scott station. Some data, however, were sent back from the South Pole via satellite, so we have confirmed that all the sites in the EHT worked well, and analysis of the data is getting started. On the technical side, the EHT has broken new ground by making VLBI observations at the shortest wavelengths to date. And the array has been extended to bandwidths, or data capture rates, that are more than 10 times what was possible just a few years ago. Parallel advances in theory are providing direction for analysis techniques through detailed modeling and simulations of black hole accretion. For more information on current EHT work in both of these areas, as well as updates, we encourage you to visit the project website. Some 56 million years ago, carbon surged into Earth’s atmosphere, raising temperatures by 5°C to 8°C and causing huge wildlife migrations—a scenario that might mirror the world’s future, thanks to global warming. But what triggered this so-called Paleocene-Eocene thermal maximum (PETM) has remained a mystery. Now, in new work presented on 27 September here at the annual meeting of the Geological Society of America, a group of scientists bolsters its claim that a small comet impact kicked off the PETM, stirring up the carbon just 10 million years after a similar event decimated the dinosaurs. The group announced the discovery of glassy, dark beads, set in eight sediment cores tied to the PETM’s start—spheres that are often associated with extraterrestrial strikes. The critical evidence was hardly the result of a targeted campaign, according to Morgan Schaller, a geochemist at the Rensselaer Polytechnic Institute in Troy, New York, who presented the team’s work. The spheres were hiding in plain sight—in sediments off the coast of New Jersey. For a summer project, Schaller and Megan Fung, his graduate student and co-author, combed through the cores, looking for the fossils of microscopic organisms called foraminifera, often used as a dating tool. But instead of “forams,” they discovered a series of dark, glassy spheres. The spheres looked like microtektites, the debris created and tossed aside when comets or asteroids strike Earth at high speeds. This was a surprise to the team: These sediments had been studied many times before. The spheres may have blended against the background of the black trays that are commonly used to hunt for light-colored forams, as visible as a full moon in the night. The team is convinced the glassy spherules weren’t erupted from a volcano—another way they could have been made. Their water content is less than 0.03%, much lower than volcanic spheres, and they contain inclusions of the fused quartz glass that is characteristic of a hot impact. Their chemistry is different from microtektites from other known impacts. But the spheres will still face a high bar before being accepted as the real thing by other geologists. Separate work by Fung clinches the case for an impact, the team noted at the geology meeting. Three of the cores she examined had large spikes in charcoal immediately above (and, therefore, just after) the layers with the spheres. The charcoal, which contains signs of charred plants, points to widespread wildfires sparked by the impact, they said. PETM-associated sediments elsewhere in the world bear signs of similar charcoal events. Others at the session were more convinced. “It is a really amazing discovery,” says Birger Schmitz, a geologist at Lund University in Sweden who also attended the talks. “The data look sound.” He says the evidence points to a small impact event of an asteroid or comet, maybe a body a couple kilometers across. However, similar objects hit Earth without triggering a global disturbance, he notes. “I have no idea of how a small asteroid could have triggered all the things that happened during the PETM.” To spark such a large carbon influx, the strike must have hit an unusual carbon-filled place like an oil reservoir, he says. News of the spherules has bounced around the community of PETM researchers for months, says Ellen Thomas, a geologist at Wesleyan University in Middletown, Connecticut. Thomas “absolutely” believes Schaller has found microtektites. But she is perplexed because she has since re-examined several different PETM cores from New Jersey and has not found any spherules; similarly, she has never seen them in global samples. If the team successfully dates the spherules to the start of the PETM, she will consider it real evidence of an impact. “If they have not dated them,” she says, “I think they may well be contamination.” The New Jersey cores were dug with rotary drills, and there’s abundant contamination in the samples, along with many spherules dating to impacts from different eras. If accepted, and that’s a big if, the strike could join a list of events associated with the PETM’s carbon injection. Many scientists believe the spike could have come from a chain reaction of events, starting with ocean volcanism cooking organic carbon out of rocks and into the atmosphere. Rising temperatures may have then released seafloor methane or thawed permafrost, driving up temperatures further. The scientists are cautious about how a small impact might fit in that chain of climate events—not all extraterrestrial strikes are the same. The PETM strike may have been a world-changing event like the dinosaur killer just 10 million years earlier. Or, it could have been like the object that struck and excavated the Chesapeake Bay 35 million years ago: locally devastating, but globally survivable. Jordan is on the verge of opening the Synchrotron-light for Experimental Science and Applications in the Middle East as workers enter homestretch of synchrotron’s construction. CERN. An experiment in science diplomacy is on the threshold of success. Synchrotron-light for Experimental Science and Applications in the Middle East (SESAME), an $80 million synchrotron lab in Allan, Jordan, announced this week its first call for research that will be conducted on two beamlines expected to switch on this autumn. Research should start in earnest early next year. A synchrotron is an important tool for many fields, as it creates intense beams of light that are used to probe biological cells or materials. There are about 60 synchrotrons in the world; SESAME is the first in the Middle East. Projects envisioned for the synchrotron include analyzing breast cancer tissue samples, studying Red Sea corals and soil pollution, and probing archaeological remains. The initiative was conceived in the 1990s as a partnership among many countries. Germany donated a big-ticket component: the injector that sends particles into the main storage ring. That project has attracted about $30 million in donations from outside the region, supplementing the construction costs financed primarily by Israel, Jordan, and Turkey. Iran has also pledged $5 million, but its contributions have been delayed by sanctions. SESAME’s operating costs are paid for by its member states: Bahrain, Cyprus, Egypt, Iran, Israel, Jordan, Pakistan, the Palestinian National Authority, and Turkey. Smith says the facility is on track for commissioning in December. Two beamlines will be ready this year—for x-rays and infrared light—and two more will be built by 2019. Gihan Kamel, SESAME’s infrared beam line scientist, says researchers from the Middle East have already begun working at the facility, by hooking up detectors and microscopes to lower-power sources at the facility. Once the synchrotron fires up, the resolution and brightness will increase dramatically. Things have been pretty quiet lately along the earthquake-prone San Andreas fault, where the grinding of tectonic plates is slowly shearing part of California off of North America. But 20 to 30 kilometers down, there’s a whole lot of shaking going on. Below the town of Parkfield, California, hundreds of thousands of slow microearthquakes called tremors go off routinely where Earth’s brittle crust gets weaker and softer. Now, scientists have shown that these tremors are triggered by the rhythmic pulsing of the tides: not just the twice-daily tides that occur as the moon revolves around Earth, but also the twice-monthly spring tides that occur when the sun and moon align and pull strongly on the planet. The finding gives scientists a new window into a deeper part of the San Andreas fault, and new insight into how stress builds up on small patches of the fault until they snap. “We’re finding out something about the loading rate on the faults and how fast this stress is accumulating on these patches,” says Nicholas van der Elst, a seismologist at the U.S. Geological Survey in Pasadena, California, and the lead author of the study. Stress builds up along the San Andreas fault as the Pacific plate tries to slip past the North American plate at a rate of several centimeters per year. But along most of the fault, the plates get jammed up and remain stuck until they reach a snapping point or are triggered to release the accumulated strain. Scientists have long wondered whether the tides could provide the proverbial straw. The tides not only slosh the oceans back and forth, but they also induce the shell of the solid earth to flex ever so slightly—sometimes in directions that happen to be aligned with faults. But as seismometers got more sensitive and were laid down in more places, scientists started to identify tremors in the lower crust. In these deeper regions, faults are weaker, and that means that tides can play a more important role. In 2012, scientists spotted deep tremors on the San Andreas fault below Parkfield that were tidally triggered, at the twice-a-day tidal peaks associated with the lunar day. In the new study, Van der Elst and his team found that bursts of tremors were also triggered during waxing of the twice-monthly spring tides, when the moon is aligned with the sun. Using a catalog of 4 million tremors that occurred between 2008 and 2015, they pinpointed the location and timing of the tremors in relation to the tides, they report today in the Proceedings of the National Academy of Sciences. Van der Elst says that the daily tidal peaks seem to trigger the littlest, deepest tremors, whereas the larger spring tide sets off larger patches of slip higher up. The tremors can’t predict the next “big one,” but in the long term, they could help scientists understand how big ones are set off. Some major earthquakes, such as the 2011 magnitude-9 Tohoku quake in Japan, are preceded by large “slow-slip events,” in which part of the fault moves quietly, without seismic notice, loading the fault to the point of rupture. Some scientists think that a burst of small tremors could signal a slow-slip event and imply that a big rupture is imminent. “We’re all waiting to see if the tremor pattern changes before or after a big earthquake,” Van der Elst says. High-tech images of the lungs of people with “latent” tuberculosis (TB) identified those at risk of developing symptoms. The new work, which researchers presented in a special TB session at the 21st International AIDS Conference being held in Durban, South Africa, this week, suggests new ways to evaluate whether treatment has cured an infection. But it could also upend the conventional wisdom that billions of people are walking around with dormant TB in their lungs that could one day erupt in full-fledged disease. “Active” TB kills an estimated 1.5 million people annually, but the World Health Organization (WHO) believes that fully one-third of the world’s population has latent TB, which means that Mycobacterium tuberculosis can’t be cultured from their sputum, but their immune cells still release interferon-gamma if mixed with pieces of the microbe. A skin test called “delayed type hypersensitivity” also is widely used to determine latency. Only about 10% of these people will develop TB at some point in their lives, and one of the big challenges in TB control is that there is no way to tell who is at risk. X-rays of latent patients’ lungs show nothing abnormal. WHO recommendations call for treating HIV-infected people who have latent TB with one drug, isoniazid, as a prophylaxis, but that’s often not done. In the new study, scientists used more sophisticated techniques to look at the lungs of 35 HIV-infected people from South Africa who had latent TB, according to the standard tests. One scan used computed tomography (CT), which shows the anatomy of the lung in far greater detail than an x-ray; the other is a positron emission tomography (PET) scan that uses an injection of radioactive glucose, which is taken up by metabolically active cells and indicates the presence of M. tuberculosis. Ten people had clear “hot” nodules in their lungs. “We saw pretty magnificent manifestations of disease,” says Clifton Barry, who heads TB research at the U.S. National Institute of Allergy and Infectious Diseases in Bethesda, Maryland, and also has a lab at the University of Cape Town (UCT) in South Africa. (Barry’s team performed the work with Rob Wilkinson’s group at UCT.) The team saw no hot spots in the lungs of the other 25 patients. The researchers continued to do lung scans during the treatment period, and they showed the lung abnormalities dissolving, which means they could use the technique to analyze treatment efficacy. “For many of us, this opened a new door of thinking about whether we really need to treat for six months,” says Jens Lundgren, an infectious disease specialist at the University of Copenhagen. “This is really a very exciting area for personalized medicine if we can separate those who can have a shorter period of treatment.” That would be welcome, because the standard regimen is a challenge for many patients. Lucica Ditiu, who leads the Stop TB Partnership, a nonprofit in Geneva, Switzerland, agrees that “latent” is not an accurate term. “These data are extremely interesting and something we should push forward,” Ditiu says. Barry notes that on average, each person who has an active M. tuberculosis infection transmits the pathogen to 10 others. “If we can identify people with subclinical disease before they transmit, that’s potentially a game-changer in terms of TB eradication,” he says.